7/27 Cup of Coffee: The Pawtucket Red Sox moved their season-long winning streak to 11 games. Portland got shut out and managed only five hits. Salem got doubled up, while Greenville and Lowell were able to come away with victories. The GCL Red Sox got behind early and lost, and the DSL Red Sox scored two runs late to get the win. Pawtucket has continued its hot hitting and has pushed their season-high winning streak to 11 games with an 8-5 victory over Scranton-Wilkes Barre RailRiders (NYY). Pawtucket sits just a half game behind division leading Syracuse (WAS). Starting pitcher Chris Hernandez, who replaced Allen Webster late after a call-up due to the Jake Peavy trade, got knocked around early giving up five runs in the first two innings. He settled down a bit finishing four innings having given up five earned runs on five hits with four walks and three punch outs. In just four innings, Hernandez threw 85 pitches, 51 for strikes. The Pawtucket bullpen was stellar combining for five scoreless innings, four hits and seven strikeouts. Pawtucket got on the board in the fourth inning when the first four batters reached base. 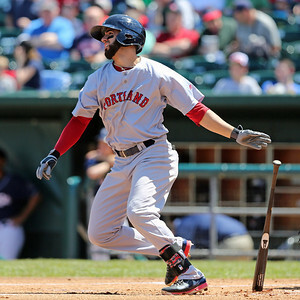 Deven Marrero doubled home two runs to tie the score and later came home to score himself on a wild pitch. Mookie Betts would single and drive in another run to push the fourth run across of the inning. Pawtucket would push three more runs across in the sixth inning when Marrero scored on a Corey Brown triple and Betts sent a ball into the seats in left field for his third home run with Pawtucket, his 10th this season overall. Marrero would finish the game going 4 for 4 with three runs batted in. Betts went 2 for 5 with two runs batted in and a run scored. Will Middlebroks was hitless for the first time in the last seven games. Portland got shutout by the New Britain Rock Cats (MIN), 7-0. Portland is now 4-6 in their last ten games. Wilfredo Boscan got the start and went 4 2/3 innings and gave up six runs on 10 hits, but did manage to have seven strikeouts. The lone bright spot on offense for Portland was Sean Coyle who managed two hits in four at-bats. Blake Swihart chipped in with a 1 for 4 night when Portland only managed to have five base runners. Portland will play the rubber game against New Britain today at 1:35. Salem struggled to put runs on the board as they fell to the Myrtle Beach Pelicans (TEX), 4-2. Justin Haley was on the mound for Salem and took the loss to move his record to 7-4 on the season. Haley went five innings and gave up two runs on three hits, with two strikeouts. Corey Littrell came on in relief and pitched four innings and gave up two runs (one earned), walked two and struck out six batters. Salem struggled to get much going on offense. Carlos Asuaje, Mike Miller and Aneury Tavarez each went 2 for 4 with two singles each. Asuaje drove in the only run for Salem on a fly-ball to center field in the seventh. Salem has lost three out of their last seven games and sits in last place in the Carolina League Southern Division. Greenville hung on to beat the Hagerstown Suns (WAS), 6-5. Teddy Stankiewicz went six innings for Greenville and evened his record at 7-7. Stankiewicz gave up four runs on seven hits and two strikeouts. Jonathan Aro came on in relief and pitched three innings giving up one run on six hits with five punch outs. Greenville went down 4-0 early but was able to tie the game with two runs in the third and two more in the fourth. Jake Romanowski led the way at the plate going 2 for 5 with a single a double and two runs batted in. Hector Lorenzana had two hits of his own on a 2 for 3 night and also batted in two runs. Aneudis Peralta chipped in two hits of his own and also had two RBI's. Lowell bats exploded in the first inning to help them to a 9-5 victory over the Hudson Valley Renegades (TAM). Lowell sent 11 batters to the plate in the first inning and got all the offense they needed. Heri Quevedo went 5 1/3 innings giving up five runs on six hits. The Lowell bullpen combined for 3 1/3 innings of shutout baseball to help close the door. The first inning fireworks were highlighted by a two-run Sam Travis homer and a bases-loaded triple by Bryan Hudson. Hudson went 4 for 5 with two triples and four runs batted in. Mike Meyers and Mauricio Dubon each chipped in with two hits apiece. Lowell went 3 for 9 with runners in scoring position on the night. The GCL Red Sox fell to the GCL Twins, 5-2. Dedgar Jimenez got the start and took the loss moving his record to 3-2 on the season. Jimenez went five innings giving up three runs on four hits with a walk and two strike outs. Gabe Speier came on in relief and pitched three innings and gave up two runs on four hits. Rafael Devers led the way at the plate for the Red Sox going 2 for 3 with two doubles and a run batted in. Javier Guerra also went 2 for 4 with two doubles of his own. The DSL Red Sox pushed two runs across in the eighth inning to help move them past the DSL Mariners, 4-3. Emmanuel De Jesus got the start for the Red Sox and went 3 2/3 innings and gave up three runs (2 earned) on four hits while walking two and striking out six batters. Algenis Martinez came on and pitched 5 1/3 innings of scoreless relief to earn the win and push his record to 4-0 on the season. He gave up two hits, struck out five and walked one. The Red Sox went 0 for 12 with runners in scoring position and left 11 men on base. Rawinson Lameda went 2 for 3 with a walk and two runs scored. Luis Yovera went 2 for 2 with a run scored and a walk. Player of the Day: Bryan Hudson gets the nod for Player of the Day honors. Hudson had his best day at the plate for the Spinners in their 8-5 victory. Hudson went 4 for 5 on the night with two triples, four runs batted in and two runs scored. Hudson was drafted by the Red Sox in the 15th round of the June 2013 draft out of Mill Creek (GA) High School. Photo Credit: Deven Marrero and Bryan Hudson by Kelly O'Connor.